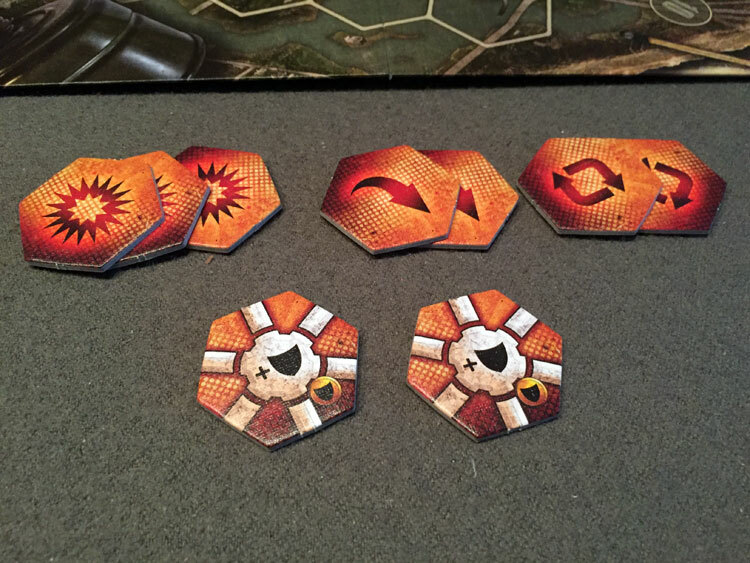 We review the Neuroshima Hex: Mephisto army from Portal Games. There have been a large variety of armies released for Neuroshima Hex so far, but Mephisto is definitely one of the more unique ones. While I’m not a huge fan of abstract strategy games, there is one title that has absolutely captured my attention. Neuroshima Hex surprised me with its unique, balanced game play, variety of armies, and just how darn fun it is. You can read all my thoughts in my full review, but suffice to say, I love it. While the core game of Neuroshima Hex comes with 4 different armies, Portal Games has been releasing new armies over the years like mad. Today we are going to look at one of the more unique armies for Neuroshima Hex, Mephisto. Mephisto actually started as a fan made army, but Portal Games decided that it was fun enough to deserve an official release. Were they right? Let’s find out. Neuroshima Hex: Mephisto comes in the standard Neuroshima Hex small-sized expansion box that you’ll immediately toss out once you open it. 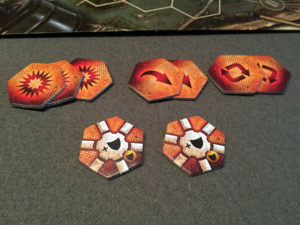 Like all Neuroshima Hex expansions, the main attraction here is the new army tiles. Three of the implants can be customized for how you want to use them. Much like the Dancer Army (review here), Mephisto is a wholly unique army. Rather than have piles of individual troops and modules, Mephisto only has one attacking unit, it’s HQ. That’s because Mephisto is not an army, but an alien creature that has grown from a small spawn a massive net of interconnected grubs. While disgusting sounding, this wacky creature can certainly cause headaches for the average army grunt. The Mephisto army is actually comprised of three main types of units. First, there is the aforementioned HQ, is armored on one side, has 3 melee attacks and can rotate as its special ability. Next are the modules. 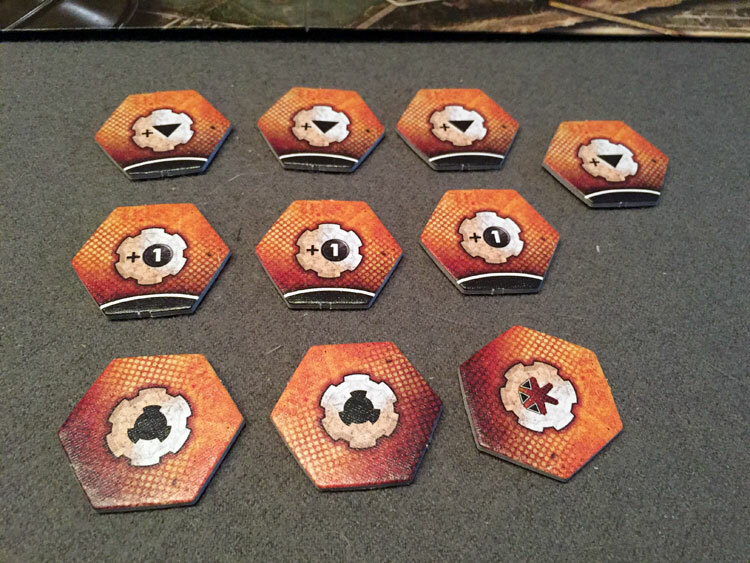 These all improve the capabilities of the HQ in various ways: initiative boosts, bonus to melee damage, increasing attacks to 6 directions just to name a few. But unlike the standard modules, these don’t have to be connected to the HQ for it to benefit. As long as they are on the map, they are providing their bonus. Finally, there is a new type of unit, the Implant. Much like the modules, these also serve to buff the HQ. However implants need to be activated before they are of any use (a player can activate one implant per turn). Some are immediate use, such as allowing the HQ to move, while others are buffing implants (Such as giving the HQ a reach attack). Buffs are deactivated after combat and must be rearmed. Implants are a new type of unit that will enhance your HQ when activated. Much like the Dancer army, I don’t think Mephisto is a good army for first time players. There are quite a few new rules to wrap your head around, such as how the implants each work and the new rules for the modules. Plus, players need to figure out how to win by ONLY attacking with their HQ. So there is definitely a bit of a learning curve with this army. I must admit, Mephisto was a hard army to figure out on my first play. In our first game, I got absolutely destroyed by my wife. Clearly the army is unbalanced in broken. After some time strategizing after the fact, I had some good ideas of how to use this monster and I’m happy to report that I won in my second attempt using Mephisto. So, obviously this army is balanced just fine. The new modules don’t have to be attached to the HQ to be used. Jokes aside, I will say that Mephisto hits a home run by how thematic this army is. I absolutely got the feeling of a giant worm-like creature with a whole series of rapidly mutating modules there are constantly improving its combat efficiency. I can just visualize this alien monster popping up from the ground to terrify and devour an unsuspecting Borgo army. As mentioned earlier, one of the hard things about using Mephisto is how many new rules a player has to learn. With every new Neuroshima Hex army, there is definitely a learning curve with how to best play the army. Since they are all so unique, it can usually take a game or two before you really know how to focus on the new unit strengths. However, with Mephisto, you have to figure out strategy along with figure out the new rules for implants, HQs, and modules. It can be a little daunting at first and will definitely slow your game down some. A handful of the tiles should feel pretty familiar to veteran players. However, other than that, Mephisto is a lot of fun to play. It’s definitely one of the most bizarre armies in Neuroshima Hex. I’d put it close to Dancer with how unusual it is compared to the other armies. I definitely liked Mephisto better than Dancer which just wasn’t for me at all. 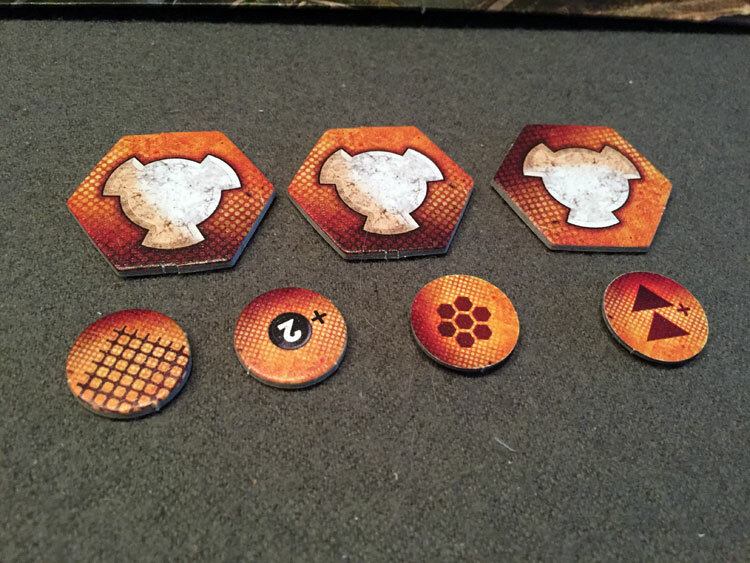 Finally, I do wish that the Neuroshima Hex expansions came with the same player aid that the 4 armies in the core set have. 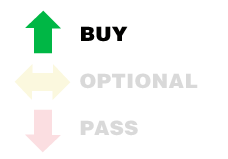 I get why they don’t, as it would make the game box prohibitively larger and more expensive. But I’d gladly pay for a player aid pack from the publisher that included a player aid for all the expansions. You hear that Portal Games? Shut up and take my Money! 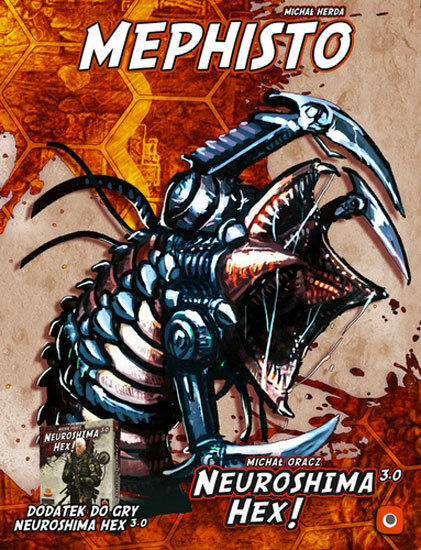 So with so many armies already released for Neuroshima Hex, the question remains, do you need Mephisto? And for me, I’d say that’s a yes. It’s definitely not the first expansion army I’d recommend getting, but that’s mostly due to its complexity and unique play style. However its unique feel really can offer a new play style for even veteran Neuroshima Hex players. If you’ve already got a few expansions, such as Stele Police and New York, then Mephisto would be a great one to add to your game. It gives you a really nice variety and you should be experienced enough with Neuroshima Hex to handle the new rules in stride. While I may not be very good at winning with Mephisto, every time I play it I figure out another bit of strategy that makes me enjoy it just a bit more. This one is worth adding to your set. 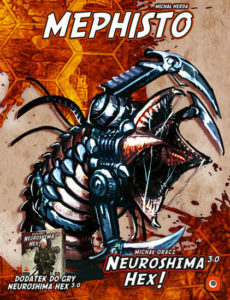 If you’d like to pick up a copy of Neuroshima Hex: Mephisto, you can get it for about $10. 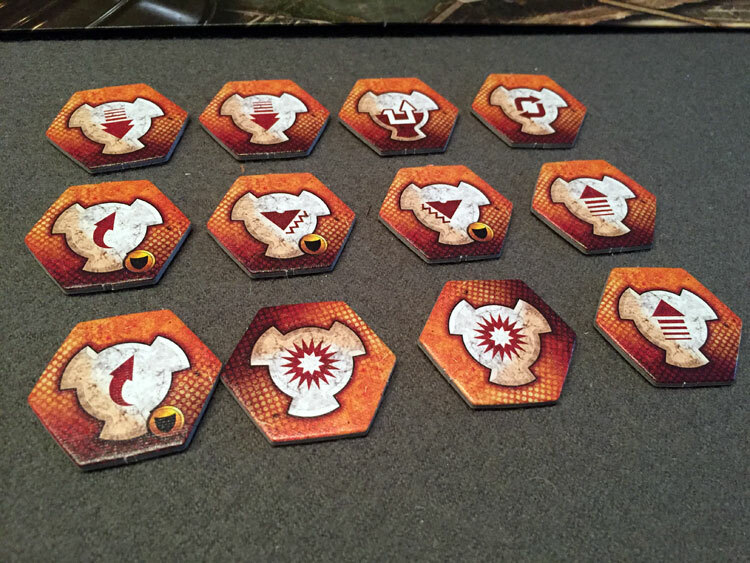 • Have to print out your own player aid.